paresis or paralysis, usually unilateral, of the facial muscles, caused by dysfunction of the seventh cranial nerve; probably due to a viral infection; usually demyelinating in type. Tapering doses of prednisone without antiviral drugs provide the most effective results. In addition, the affected eye should be protected from drying with artificial tears or unmedicated ointments. Some practitioners advise wearing sunglasses during the palsy or patching the eye to protect it from foreign bodies or drying. Partial facial paralysis is usually resolved within several months. The likelihood of complete recovery after total paralysis varies from 20% to 90%. Paresis or paralysis, usually unilateral, of the facial muscles, caused by dysfunction of the facial nerve. Although we could not rule out the possibility that our patient's disease entity was Bell palsy with an incidental finding of a cystic lesion in the temporal bone, the imaging studies--CT and MRI scans of the temporal bone--provided beneficial information on the diagnosis and treatment of facial nerve palsy in our patient. A 4-year-old boy with a history of pre-B-cell ALL, status post-chemotherapy, presented with left-sided Bell palsy that improved with acyclovir and prednisone. 1) Clinical manifestations of such include otitis media and Bell palsy. The authors performed a retrospective review of data obtained in 11 patients who were treated at a university-based referral practice between July 1988 and September 2001 and who presented with acute facial nerve paralysis mimicking Bell palsy. Although Bell palsy remains the most common cause of peripheral facial nerve paralysis, patients in whom neoplasms invade the facial nerve may present with acute paralysis mimicking Bell palsy that fails to resolve. Although Bell palsy has been defined as idiopathic, there is now good evidence to implicate the activation of herpes simplex virus near the geniculate ganglion as the cause of this disorder. Eleven of these 320 cases met the criteria of the study--namely, presentation with facial paralysis mimicking Bell palsy that was found to be caused by an occult malignancy, The records of these patients were retrospectively reviewed. 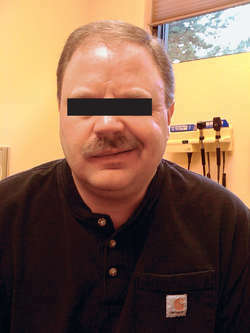 After a diagnosis of Bell palsy was reached, he had been referred to us for treatment. He had apparently been told he had a right-sided Bell palsy.